"Are there many roots on these trails? We don't have many roots in Ecuador," said Isidro Ponce, one half of the Ecuadorian Open Men's team, Chivo y Gugu, as he enjoyed breakfast at the Cumberland Recreation Hall. You bet there are roots! There's also a bit of loose rock, some grippy basalt slab, loamy sweetness, bermed flow and pretty much every feature that makes Cumberland's brand of West Coast singletrack legendary. That's what makes the BC Bike Race so unique; riders from across the globe congregate to experience legendary handmade BC singletrack. Each participant brings a unique perspective, their skills and expectations honed on the familiar trails of home. Some get schooled, others do the schooling. Ponce was about to get baptized in the trails of Cumberland - one of the coolest mountain biking communities in BC. After licking their wounds from yesterday's punishing Maple Syrup descent, racers were ready for Stage 2 in Cumberland. Overhead there was blue sky and soon under the tires there would be a 40km tour de Cumberland singletrack, highlighted by the day's feature trail Vanilla, a ripping, smooth descent of bermed chicanes that is one of the region's most popular trails. But first there was work do. After spinning down Cumberland's historic main street, racers tackled a sustained 10km, undulating gravel road to the top of the Cumberland trail network. From there they dropped into the deep dark woods of Further Burger, a classic tech-gnar singletrack descent featuring greasy off camber roots, handlebar trimming tight trees and rock drops. While foreigners like Ponce did battle with Cumberland's legendary trails, riders like Vancouver's Jason Cameron was comfortably in his wheelhouse. "This is the kind of singletrack that I was born for," said Cameron, who is on the hunt for a top podium position in Veteran Men's, so far claiming second place in the category on both the Cowichan and Cumberland stages. Although Cameron is here to compete, he's also here to soak in the good vibes of the traveling mountain biking community. So too is Rocky Mountain’s Quinn Moberg. The Squamish rider rolled to a 6th place finish on the Cumberland course in Open Men's, while local boy Geoff Kabush finished first for the second day in a row and started to put some distance on second and third place finishers Sam Schultz and Francois Bailley-Maitre. "Cumberland is where I love to ride with my friends. It's a very welcoming community," Moberg said. Cumberland has the mountain biker's four essential food groups - craft beer, pizza, coffee and epic singletrack. Longtime Cumberland course director Jeremy Grasby has been at the heart of the local trail building and riding community for years and is a past president of UROC (United Riders of Cumberland). This grassroots society has successfully navigated tricky land access issues, forged excellent partnerships with landowners and transformed a formally rogue network into a fully sanctioned system of trails that is the envy of many other communities. The icing on the cake: Cumberland even has a town crier who jubilantly recited a cycling-inspired poem before the race start. Racers are the beneficiaries of the Cumberland trail network that continues to grow. New this year was a twisting tour of the Eastern Bloc zone, which has been the focus of much local trail building in recent years. After the morning's big climb and technical descents, this pedaling intensive, technical XC node sprinkled with customary West Coast roots and rocks put tired racers to the test. After a mechanical left her out of contention yesterday, Liv Trail Squad rider Kaysee Armstrong was back in the saddle and feeling strong in Cumberland, savoring some of her favorite style of trail. "Today was amazing. It was steep and rooty and it really kept you on your toes," said Armstrong, who rallied to a second place finish behind Nash. "And that second lap was so techy and turny that it almost made me dizzy." Quadra Island resident Jack Mar and first time BCBR participant is soon to celebrate his 65th birthday. He was dreading the big road climb early in the course but found himself summoning everything he had on the rolling terrain where riders were given few opportunities to coast. "There was nothing easy about the XC in the second lap," Mar said at the finish line, tired but still smiling. After two days on the trail, camaraderie between riders inevitably starts to build. Another first time BCBR participant, Lora Mcauley, was back riding on the trails of her former hometown before she relocated to Squamish five years ago. Today she locked into pace with a Costa Rican who suddenly stopped on an easy ascent and yelled that there was a snake on the trail. In Costa Rica, home to dozens of deadly poisonous snakes, when you see one it gets your attention. In Canada, not so much. "We had a good laugh," Mcauley said. With Day 2 in Cumberland wrapped up, it was time to wash bikes, refuel, rehydrate and load the buses for BC Ferries' Little River terminal. Then with time to spare before boarding the ferry, hundreds of riders soaked aching leg muscles in the refreshing Pacific Ocean. During the ferry crossing to Powell River, host community for Day 3, some lucky participants were treated to multiple humpback whale sightings halfway between Vancouver Island and the BC Mainland. Upon docking, dozens of Powell River citizens, complete with a bagpipe band and a guy dressed up in a bear costume, had gathered to give a Powell River welcome that has become a BCBR tradition. For racers it was a hint of what's to come on Day 3. 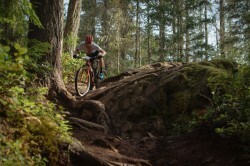 Another renowned goldmine of singletrack on the slopes of BC's rugged Coast Mountains.